18th and 19th century furniture, rustic, provincial manor-house furniture and sigend Stockholm work. Per Fryxell started Fryxells Antivitetshandel in 1986 and zestfully runs it concurrently with his profession of middle-school teacher. The shop occupies is in the same house as the private property at Storgatan 30 in Färjestaden ,Öland. In addition to selling antiques, Per Fryxell spends a lot of time restoring furniture to its original condition, which means painstaking, time-consuming renovation to bring out the original workmanship. 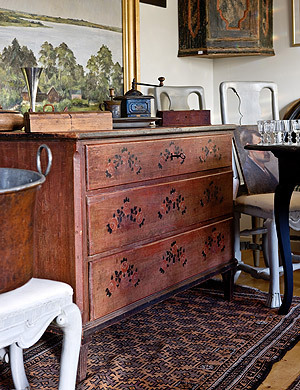 During this slow process he gets to know his furniture and antiques down to the tiniest detail, which tells him a very great deal about the history of the item concerned, knowledge he readily shares with others and gives careful account of, so that customers will feel secure in their purchas . In the antique shop you can see a regional connection and consists to a great extent of Öland vernacular, Öland provincial furniture and also a certain amount of furniture and decorative art from Småland as well as works from the Stockholm area . Per Fryxell likens a visit to the antique shop at Storgatan 30 in Färjestaden to driving to the nearby Himmelsberga Museum, wich has a large collection of traditional rural artefacts. O:B:S From May 2015 is all activity consentrated to Storgatan 30 in Färjestaden ,Öland.